On Thursday 3/17/2011, RTS sells the following 10 stocks short in its RTS 20110317 Short Portfolio at the open. Market is very much over sold. Barring breaking news from ME and Japan, SPX could rally viciously (short covering) tomorrow to test the lower channel line of its primary price channel around 1275. 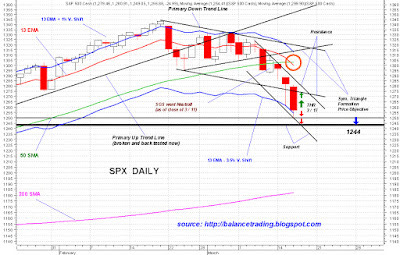 Also today, 13 D-EMA crossed 50 D-SMA (orange circle) on SPX daily chart. Although that crossing in itself is bearish and signals more selling to come, but in very near future it's an indication of exhaustion of an aggressive trend (secondary sharply down trending price channel). 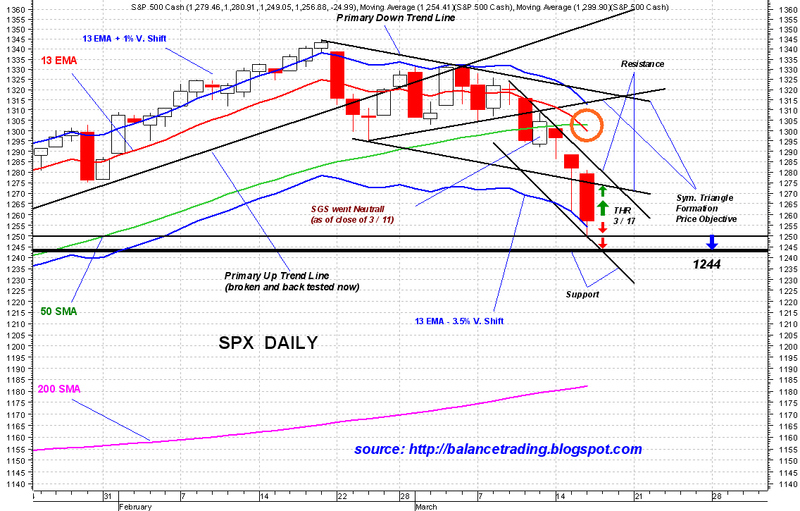 The price objective for the symmetric triangle formation downward break out is 1244. A possible bullish scenario for tomorrow is for SPX to drop down to mid 1240's and then rally back up to close above today's close. I wouldn't be surprised to see that tomorrow (it's already met on SPX futures tonight).